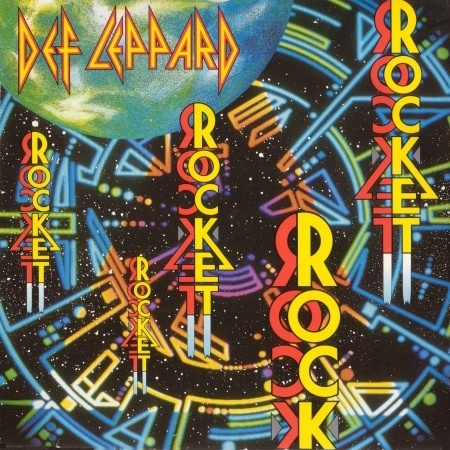 Def Leppard's classic single Rocket hit Number 15 in the UK singles chart 29 years ago on this day in 1989. The sixth and final UK single to be taken from the 'Hysteria' album was released on 30th January. The band performed the song on UK TV show Top Of The Pops which helped it move up the charts. This came off the back of another performance - 'PSSOM' at the Brit Awards earlier in the same week. The single entered the chart at 31 before rising to 20 and then its peak of 15 with a third week in the Top 20 at 19. In all it spent 7 weeks on the chart, the fifth Top 20 hit from the album in the UK. Shown below are some quotes from the band about this song. Simple Minds were at Number One on this day with their single 'Belfast Child'. 2099, 2012 and 2017 tour mates Poison were at Number 20 with 'Every Rose Has its Thorn' (its highest position). Read some comments below on the song from various interviews. "January 1989 - In your hands is Def Leppard single #7 from 'Hysteria'. You gotta hand it to the Brits for this one 'cause they thought it would be a great follow up to their last single, which was either "Sugar" or "Love Bites" (I've lost track). They wanted a video for the track and since we had such a good time making the "Rocket" video (our childhood, what can we say! ), why not give everybody a chance to play and watch "Rocket". Right now we're back making the 5th album, thrilled to bits with everything that's gone on and looking forward to putting out our live concert video; In The Round-In Your face (something like that). One track on this piece of vinyl/plastic/whatever comes from that live video. I believe it was song number 3 in the show: "Women". "Probably our most adventurous song from 'Hysteria'. A cool video and my favourite live song." "My favorite song to play is "Rocket." I think that kind of represents Def Leppard in one sentence, you know? Big guitars, big drums, a tribal song, actually. It's what the song is about, our heroes and the whole thing." "Even in demo form, Joe said, 'I've got an idea to use the rhythm from this African Burundi tribe.' There was a song in the '70s called Burundi Black, and I remembered it, and so the idea was to use that feel and turn it into a real rock anthem. It was a little weird and quirky, but it really came together. "I feel that Rocket is the absolute pinnacle of Def Leppard. It sums us up in a nutshell: massive drums, massive guitars, big choruses, and lyrically, it's what the Yeah! album was. So you've got all of our influences and elements right there. "I used the Strat on all the jangle parts and the rhythms. We had a lot of fun making that Star Wars bit in the middle - you know, 'Countdown commencing' and all that. It was an absolute blast. It's Star Wars for the ears. And again, what was great was to not be restricted by your genre. We knew what we were doing was different and it sounded great. "We had started taking weekends off, and I remember Nigel Green, the engineer, sitting in the studio with an AMS delay machine, and he was delaying all the stuff by hand. 'Ahh-ahh-ahhh…' Now you can do that so easily, but he had to do it the hard way - physically."